Self-care is something we’re hearing more and more about, and there’s a lot of confusion about what it is. I’m going to say straight away that self-care is not simply about taking bubble baths. Yes, they can be a way of practising self-care but if that’s all it was I’d be in deep trouble because I don’t like baths and have zero inclination to take one! I don’t find it helpful to suggest something so integral to our wellbeing can be provided by a simple soak in the tub. Self-care is the ordinary stuff and the special stuff and the not very interesting, boring stuff too. The clue is in the name, it’s taking care of ourselves, just as we do everyone else around us. So, you take care of your friend by giving her a hug and being sympathetic when she’s having a tough day, you can do that for yourself too. You care for your child by taking them to regular dentist appointments. Going for your own dental check-up is self-care too. Encouraging your partner when they’re nervous about a presentation at work, rather than telling them they’re stupid and bound to mess up, is what you do to care for them. And that’s exactly the way to treat yourself and when you do, it’s self-care. Self-care is allowing yourself to feel your feelings rather than pushing them away or telling yourself they don’t exist. It’s quietening the internal monologue that tells you everyone thinks you’re rubbish. It’s eating a tasty nourishing meal, it’s going for a walk to get some fresh air, it’s leaving the washing-up while you giggle at a movie with your kids, it’s taking five minutes to meditate, it’s knitting or drawing or reading or doing whatever creative activity you enjoy. Self-care is not putting yourself first or above everyone else. It’s not being selfish or self-indulgent or vain. Practising self-care doesn’t mean doing whatever you like with no regard for anyone else’s feelings or needs. It isn’t a luxury or an extravagance and it doesn’t need to cost your time or money. Self-care is whatever you do to take care of yourself, just as you care for those around you. It’s not about saying me first, it’s about saying me as well. You may be reading this and thinking to yourself that it’s fine for other people but you don’t have time for self-care. You’ve got a busy life, people depend on you, what would everyone think if you started doing whatever you liked and dropped your responsibilities? First of all, people think about you a lot less than you imagine. And secondly, self-care isn’t about forgetting your responsibilities and stopping caring for everyone else. It’s about looking after your own needs as well as everyone else, not instead. I know that it’s important to you that all the people you care about are looked after and that you want to do whatever you can to make sure they’re safe and happy. I don’t want you to stop caring about other people, the world needs more not less of that. But the world, and the people in your life, need you to be well and happy and cared for too. Because when you meet your own needs, when you look after yourself, you are in a much stronger, healthier position to live your life fully and care for those around you. Think about it. When you’re feeling rested, nourished, your inner critic is quiet, when you feel good you can deal with the kids squabbling or your boss dropping a project on you more calmly than when you’re knackered, you’re hungry or you’re beating yourself up about something. You can find the funny side, you can be more creative, more inspired, more relaxed, more caring, more you, when you look after yourself. Taking care of your own needs isn’t a nice to have, it’s a must have. I’m guessing you already practise self-care, even if you don’t think of it like that. Going to the doctor when you feel unwell or feel something’s not right. Getting an early night when you’re tired. Joining an exercise class when you’d rather veg on the couch with a tin of biscuits. Climbing back into bed on a Sunday morning with a mug of tea. Reading this post is an act of self-care. You wouldn’t be reading if you didn’t want to learn about ways you can reduce your overthinking and enjoy your life more and that is taking care of yourself. And I am enormously thankful that you’re here and you’re giving yourself this care. 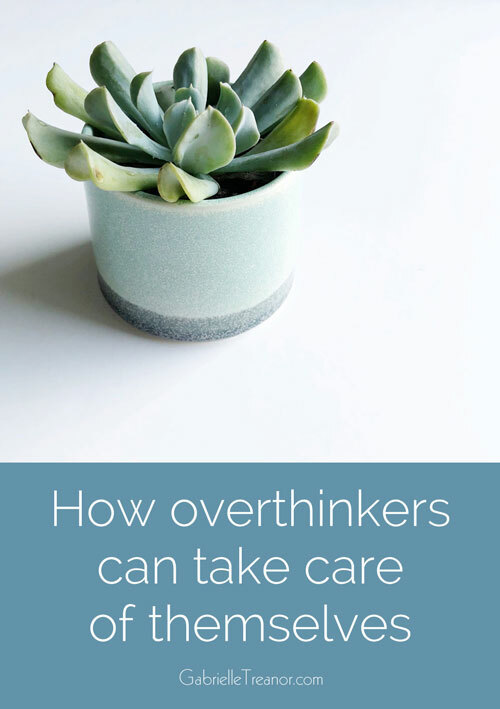 So, how does self-care help overthinkers,? When we’re feeling beaten down by life, it’s hard to see a balanced view of the world. When we’re run down it’s natural to spend more time living in our heads, going over things, wondering what we could have done differently, imagining all kinds of terrible scenarios in the future. We don’t have the energy to recognise what’s happening, to challenge it or do something about it. When you meet your own needs, when you take care of yourself, in the same way you care for your family and your friends, you’re giving yourself the chance to feel better mentally, to overthink less. If you’re looking after yourself just as you would your best friend, you’re going to be in a stronger position to catch yourself when you’re overthinking and to take action, to slow the mental whirlwind and soothe your nerves. And you know that when you’re able to do this it feels good, you feel more like the real you and you’re more connected to those around you. Everybody wins. So, you see, self-care isn’t a luxury, it’s a necessity. What are you already doing to take care of yourself? What can you do today to meet your own needs and give yourself the care that you give so generously to those around you? And how would that make you feel, what difference would that make for you? You can also listen to this post as Pressing Pause podcast episode 11. I just want want to use this opportunity to say thank you, my boyfriend is a massive overthinker and high achiever and this morning I introduced him to your podcast, he rung me on the way to work to tell me he was three episodes in!!! I listen to you during my lunchtime walks and it resets my compass.